Gloria Hewitt similarly defied the odds decades later, when she earned a PhD in mathematics at the UW—only the seventh African American woman at any university to earn a mathematics PhD. She became a professor and department chair at the University of Montana. This year, UW endowments have been established in the names of both women: The Dorothy Morrow Gilford Endowed Chair of Statistics in the Department of Statistics, and the Gloria Hewitt Endowed Graduate Student Support Fund in the Department of Mathematics. Gloria Hewitt earned a PhD from the UW and taught at the University of Montana for 38 years. She was the seventh African American woman to receive a doctorate in mathematics. After talking with Gloria about the plan, Irving felt that her recognition should live on even after those one-time funds were exhausted, so he created an endowment through a combination of funds, including seed funds from him and his wife, a portion of the WRF gift, and other funds. The endowment provides graduate student support with an emphasis on those underrepresented in mathematics. Irving looks forward to additional donor contributions that will allow the endowment to become a graduate fellowship. Gloria Hewitt at a 2018 celebration of her career. By high school Hewitt excelled in mathematics, and her first calculus course as an undergraduate at Fisk University sealed the deal. “I recall sitting on campus doing calculus problems for recreation,” she said in an Agnes Scott College interview. Though Hewitt planned to become a high school math teacher, one of her professors had other ideas and recommended her to colleagues at the UW for graduate study. Hewitt was offered a teaching assistantship and soon arrived in Seattle, where she found a welcoming community. “Some of my fellow graduate students did all they could to help and encourage me,” she recalled. “They included me in most of their activities. 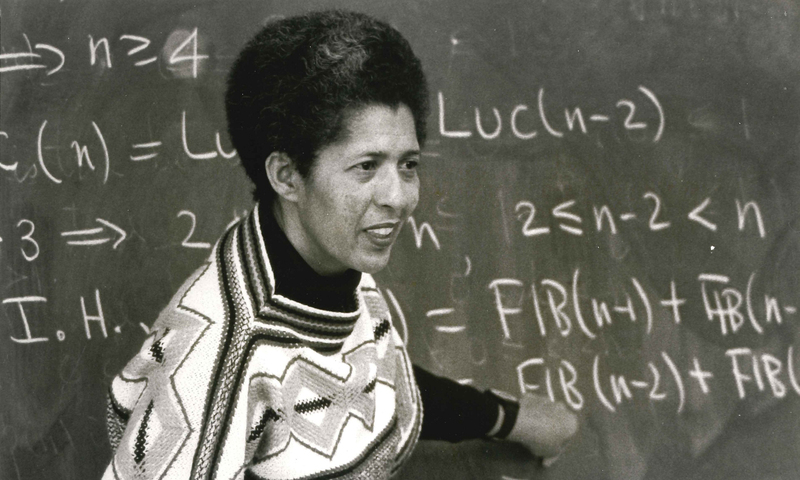 I know this situation was not the norm for a lot of Blacks studying mathematics, but I was fortunate enough to be at the right place at the right time.” Hewitt was hired by the University of Montana while still completing her PhD. Her long career also included serving on the committee that writes questions for the mathematics section of the GREs, and serving as a faculty consultant for the Advanced Placement examination in calculus. Dorothy Gilford in 1960, during her time at the Office of Naval Research. For Dorothy Gilford, it was a high school guidance counselor who suggested she study mathematics at the University after noticing her high grades in secondary school math. “It really wasn’t the best advice, considering the career opportunities at the time,” Gilford recalled in a 2007 interview in Statistical Science. “If you look a little beyond the university, the career opportunities were very, very limited.” Her female mathematics professor confirmed the dearth of opportunities, but Gilford nevertheless stayed on at the UW to do graduate work in mathematics. She then pursued a doctoral degree at Bryn Mawr, shifting her focus to statistics. Despite never completing her dissertation, Gilford went on to a brilliant career as a statistician at national agencies, including the Civil Aeronautics Administration, the Federal Trade Commission, the Office of Naval Research, the National Center for Education Statistics, and the National Academy of Sciences. She headed departments and divisions at each agency, and chaired the Conference Board of the Mathematical Sciences. She was elected as a Fellow of the American Statistical Association and the Institute of Mathematical Statistics, and in 1965 won the Federal Women’s Award, at that time given annually to the five top women in government. Gilford died in 2014, leaving a generous bequest to the UW Department of Statistics. With that support, the department established The Dorothy Morrow Gilford Endowed Chair of Statistics, which enhances the University’s ability to recruit and retain faculty in Mathematical Statistics and provides strategic support for women in the Department of Statistics. Future generations will benefit from the Gilford and Hewitt endowments, but also from the legacy of these early pioneers who made their mark — brilliantly — where few women had gone before. Learn how you can contribute to the Gloria Hewitt Endowed Graduate Student Support Fund or The Dorothy Morrow Gilford Endowed Chair of Statistics.